1) Bericht von Roure-Bertrand Fils October 1911, 72. 2) Report of Schimmel & Co. April 1900, 39. 3) Berichte von Roure-Bertrand Fils October 1902, 24. 4) Chemist and Druggist 70 (1907), 815. 5) Report of Schimmel & Co. October 1896, 65; October 1912, 97. 6) Jeancard Fils & Cie., Rev. de Grasse 1911, No. 25. 7) Comp. sandalwood oil p. 336. Production of Bulgarian Oil of Rose. The cultivation of roses1) is carried on particularly in southern Bulgaria in the valley of Kazanlik and Karlovo2). Outside of this district there are several plantations in the plains of Philippopolis and more particularly in Brezovo. At the lower altitudes (300 m.) the harvest is relatively early e.g., in Kazanlik (Kezanlik), Brezovo and Karlovo. In the districts of Kalofer (700 m.) and Klissoura (800 m.) it is relatively late. In general the rose fields occupy an intermediate area between the grain fields of the plains and the forests of the mountains. Moreover, a light, stony soil which is not overmoist is selected. The red Rosa damascena and the white Rosa alba are mostly cultivated. The distiller would prefer to see the latter eliminated, but the farmers adhere to their old practices. The roses are planted in rows 2,5 m. apart. The individual plants are placed in holes from 40 to 50 cm. deep, are covered with a layer of earth 5 to 6 cm. in thickness and with stable manure; the plants have to be hoed twice each year. The yield per hectare of a good plantation runs up to 4000 kg. per year, but as a rule is much less. The gathering of the roses begins late in May or early in June. Frequently there is a scarcity of women to do the picking. The Bulgarians and Turks are somewhat indolent. Instead of beginning to pick before daybreak and interrupting the labor when the sun is high, they start late and gather all day long. The result is that frequently the flowers arrive at the still in a bad condition (scorched and discolored). The temperature in the rose bags occasionally rises to 50°1). Fig. 48. Bulgarian rose oil still. 1) P. Jeancard, Journ. Parfum. et Savonn. 20 (1907), 254; Americ. Perfumer 2 (1908), 192. 2) Comp. the accompanying map of the Bulgarian rose districts. The distilling outfit used in Bulgaria is very simple and is the same as that described more than 40 years ago by Baur2). The fire-place consists of masonry work, and the fuel is supplied by the near forests of the Balkan mountains. 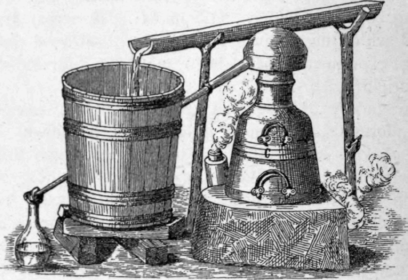 On it rests the copper still (Iambic) of 110 liters capacity (fig. 48) and 1,1 m. high. The body of the still is conical and provided with two handles by means of which it can be removed from the fire-place. The diameter of the still is 0,8 m. at about the middle of the still and 0,25 m. at the neck. The helmet which is 0,5 m. high and has the shape of a puff-ball fits well into the neck of the still. The joints are luted with clay and strips of cloth. The helmet is provided with an exit tube which slopes toward the ground at an angle of 45 . This connects with the condensing tube, which is a straight tube of the thickness of a thumb and 0,25 m. long. It passes through a tub made of oak or beech wood, filled with water. The condensation water is conducted to the tub by means of a wooden gutter. 1) A detailed account of the conditions prevailing will be found in the inaugural dissertation of Georg Sjaroff, Die Rosenkultur und RosenOlindustrie in Bulgarien, Leipzig 1907. The author, a Bulgarian, treats the cultivation of the roses, the distillation of the oil, its commerce, and the economic aspect of the industry. He supplies statistics concerning the area under cultivation, prices of raw materials and final product; discussing in detail the causes of the low price of the oil which prevailed at that time. Interesting items, based on personal observations, may also be found in a paper by P. Siedler, Uber Rosenkultur und Rosenolgewinnung in Bulgarien. Berichte d. deutsch. pharm. Ges. 22 (1912), 476. 2) Neues Jahrbuch fur Pharmacie und verwandte Facher 27 (1867), 1 - 20; Jahresb. f. Pharm. 1867, 350. A considerable number of these stills are mounted under a roof. According to G. Sjaroff, such an outfit is known as giulapana. Each still is charged with 10 to 15 kg. of freshly picked roses and 75 to 100 or 120 liters of water. The distillation is continued until 2 flasks of 5 liter capacity each have been filled. The water remaining in the still is used for the next distillation. This method is quite irrational because of the large amount of extractive matter and salts that collect in the course of time. Their presence can scarcely be without influence on the delicate perfume. After sufficient distillate has accumulated, 40 liters of the rose water are transferred to a still and the first five liters of distillate cohobated. At first this second distillate is a white, turbid liquid. Upon cooling it becomes clear, the oily particles separating at the surface. For the purpose of separating the floating oil, the Bulgarians make use of a small funnel-shaped instrument of tin provided with a long handle having a very fine opening at the bottom. This opening permits the water to pass through but not the semi-congealed oil. In this manner oil and water are separated. According to a quite unreliable and equally improbable account, 3000 kg. of flowers yield 1 kg. of oil in Bulgaria. No doubt, a much larger amount of flowers is needed. With the requisite amount of palmarosa oil 3000 kg. of flowers may suffice to produce 1 kg. of "Bulgarian oil of rose"! After the oil (Bulgarian guljag) has been adulterated for a second time with palmarosa oil by the dealer, it is transferred to tin-lined copper flasks (estagnons) and then enters the market as Bulgarian oil of rose. For this purpose the palmarosa oil is specially prepared by exposing it to the sun in shallow dishes. The designation "Turkish" as applied to oil of rose is no longer correct. At least in European Turkey no rose oil is produced.